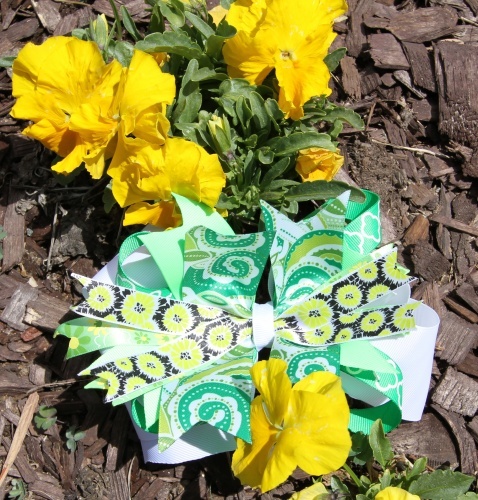 Get blown away to the Land Of OZ with this Emerald Green Pinwheel Bow! This bow has emerald to lime green ribbons flowing around. Follow the yellow burst flowers to see the shamrocks on the four looped ribbons. See the emerald green satin paisley ribbons topped with lime burst flowers. This pinwheel was designed by Lexa Lou herself inspired after she watched the Wizard of OZ movie. This bow will magically match any of your favorite green outfits and wisp you away to your favorite place.